Complete with our FREE shipping (this SAVES you a further $15). 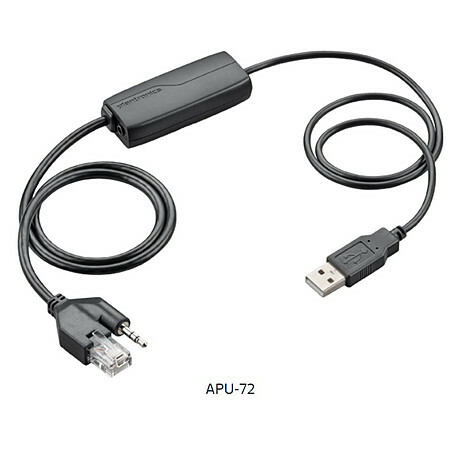 The Plantronics APU-72 Electronic Hook Switch (EHS) module enables wireless headset users to place or receive calls without the need to lift the handset of your Cisco 8961, 9951 & 9971 series phones. This EHS cable also works with Avaya (formerly Nortel) 1120E, 1140E, 1150E, 1165E & Samsung SMT-i5343 phones. Freedom to move away from your Cisco, Avaya or Samsung phone and answer calls from wherever you are, simply with a press of your wireless headset call control button. The Plantronics APU-72 EHS only works with the following Plantronics wireless headsets: CS510, CS520, CS520, Savi WO300, Savi WO350, Savi 700 series. Use the APU-7 for earlier model headsets. Direct connection to your Cisco IP phone, which eliminates the need for a mechanical handset lifter device. This product supercedes the APU-70 and APU-71 Electronic Hook Switches.